We’re not ones to take sides – but to us, there’s a clear winner when it comes to Brisbane breakfast regions (alright, it’s a four-way tie – but the south side still really has it going on). So while the east side might have their seaside views, and the north side can keep their plentiful suburban drinking spots (what’s going on there guys? ), it’s the south side we’re heading to next time we get a craving for waffles and bacon. This Insta worthy café is kicking our mornings off to a good start with their freshly brewed coffee. Enjoy the city’s best cold drip brews, batch brewed filter coffee and espresso while you’re snacking on tasty eats like spiced cauliflower and chickpeas on blue corn tortillas, or grab some of their locally made produce including honey, peanut butter and beans right in Eden Lane. We don’t know about you, but there’s something about seeing fairy floss on our breakfast that makes our hearts sing with joy (maybe it’s because we weren’t allowed sugar as a child?). Lucky Little Clive doesn’t judge our gown up addiction to sugar – and whacks a pile of fairy floss on everything from their monthly waffle specials to their buttermilk pancakes. Even the smashed avo on toast here is worth crossing the river for (it comes on pumpkin bread with spiced labne and smoked dukkah, FYI), but if you really want to make the most of your trip, make sure you get the tonka scented French toast with roast peach, apricot coulis, meringue and fairy floss. You can’t eat Snickers for breakfast, right? Wrong – although you totally could if you wanted (no judgement here), Eden Lane’s Kiss the Berry Snyckers acai bowl with banana, peanut butter and cacao is the healthy alternative. As well as organic acai bowls with fresh fruit and other great toppings, you’ll find refreshing smoothies and bowls to get you through the day with no regrets. ‘The boards have flipped!’ Those four words get us excited every time, and if you don’t know what we’re talking about, it’s time you headed to The Jam Pantry and found out. 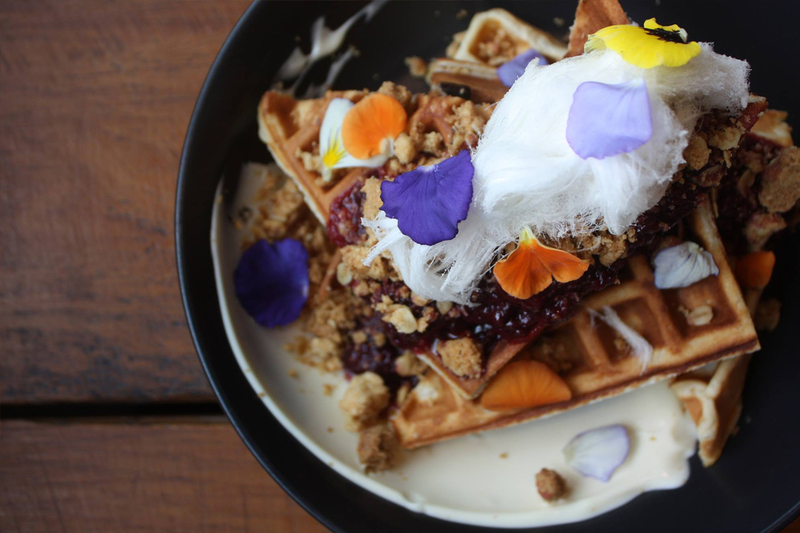 Just don’t blame us when you find yourself addicted to their creative Brisbane breakfasts. Lady Marmalade’s breakfast menu always seems to grow ever larger – which may have something to do with the fact that they’re forever dishing up epic specials that their regulars just refuse to let go. Long story short, you’ll need at least a few visits to eat your way through it. With its retro furniture, mismatched crockery and eclectic style Southside Tearoom is as quirky as its owners, John & Patience of indie band The Grates. With a brunch menu boasting everything from mini French toast breakfast burritos to gingerbread pancakes with roast pear and meringue and breakfast cocktails to cure any hangover (we’re all about the morning margarita), it’s the jewel of Morningside. As well known for their pup-friendly atmosphere as they are for their deadest delicious breakfasts, you’d have to be barking mad not to put Todd & Pup on your must try list. We’re all about the totally on trend earl grey lavender waffles with whipped honey cream, lemon lavender and blueberry syrup. Snag & Brown know just how to put themselves in the spotlight: serve up banana bread French toast with salted caramel and mascarpone for breakfast, along with dishes like braised pork belly with popcorn crackling and of course, plenty of snags! Who knew the south side was really Brisbane breakfast central. - the gourmand that won't settle for cereal.